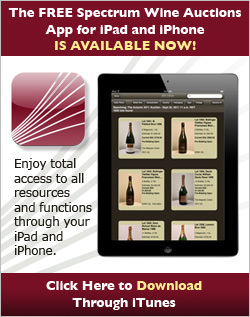 The modern history of the Eisele Vineyard began when it was purchased by Milton and Barbara Eisele in 1969. Over the subsequent 21 years, the Eiseles supplied acclaimed fruit to some of California’s benchmark wineries, including Ridge (1971), Conn Creek (1974), and Joseph Phelps (1975-1991). Then, in 1990, Bart and Daphne Araujo purchased the Eisele estate and proceeded to invest in temperature-controlled caves, property and vineyard advancements ultimately resulting in both organic and biodynamic certification, and the property’s first winery. From 1991 through 2013, the Araujos produced superlative Cabernet Sauvignon (as well as Sauvignon Blanc, Viognier, and Syrah) from this historic vineyard. And their tireless efforts did not go unnoticed: scores in Robert Parker’s The Wine Advocate have averaged over 95 points since 1991, and the 2013 was recently awarded a potentially perfect barrel score of 96-100. And alas, in the same year, Fraçois Pinault’s Groupe Artemis, the longtime owners of Château Latour, Château Grillet, and Domaine d'Eugénie (formerly Domaine René Engel), purchased Araujo and its Eisele Vineyard, beginning a new chapter in this storied property’s history. And so today we are proud to offer an extraordinary selection of wines from the Eisele Vineyard in our Summer 2015 Auctions. 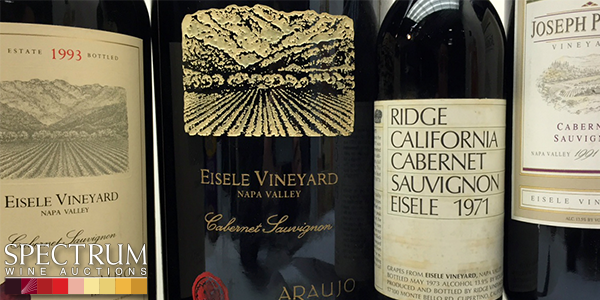 While historic inaugural vineyard-designate Eisele Cabernet bottled by Ridge Vineyards in 1971 was just sold in our Live Auction (Lot 91), the current online sessions feature an additional twenty-one outstanding Eisele lots dating back to the great Joseph Phelps Eisele Vineyard 1986, here in double-magnum format (Lot 3578). 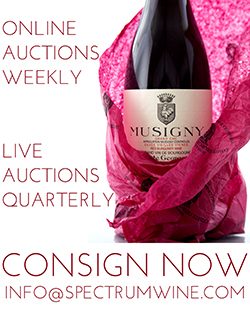 The current offer includes two vintages of Phelps Eisele (1986 and 1991), the Araujo Sauvignon Blanc and Viognier across three vintages, and the Araujo Estate Cabernet Sauvignon ranging from 1991 through 2008 in bottle, magnum (1.5L), double-magnum (3L), and rare imperial (6L) formats. Lot 2076 deserves special mention, however: this lot showcases one bottle of Araujo’s rare Vieilles Vignes bottling from Araujo’s inaugural 1991 vintage. The Vieilles Vignes, only produced from 1991-1998, was produced from the vineyard’s oldest, head-trained, Eisele clone vines planted on St. George rootstock in 1964. This block was the source of the legendary 1971 Ridge Eisele, 1974 Conn Creek Eisele, and 1975 Phelps Eisele bottlings. The Vieilles Vignes bottling was discontinued in 1998 when the old Block 3 vines finally succumbed to virus. This wine was not commercially released; indeed, this Lot represents the only available offering of the ’91 Vieilles Vignes in the world. Lot 2074. Araujo Estate Cabernet Sauvignon Eisele Vineyard 1991. 1 Magnum, 1.5L. Lot 2075. Araujo Estate Cabernet Sauvignon Eisele Vineyard 1991. 1 Double Magnum, 3L. Lot 2072. Araujo Estate Cabernet Sauvignon Eisele Vineyard 1993. 1 Double Magnum, 3L. Lot 2073. Araujo Estate Cabernet Sauvignon Eisele Vineyard 1993. 1 Imperial, 6L. Lot 2071. Araujo Estate Cabernet Sauvignon Eisele Vineyard 1994. 1 Imperial, 6L. Lot 2070. Araujo Estate Cabernet Sauvignon Eisele Vineyard 1995. 1 Bottle, 0.75L. Lot 2067. Araujo Estate Cabernet Sauvignon Eisele Vineyard 1996. 1 Magnum, 1.5L. Lot 2068. Araujo Estate Cabernet Sauvignon Eisele Vineyard 1996. 1 Double Magnum, 3L. Lot 2069. Araujo Estate Cabernet Sauvignon Eisele Vineyard 1996. 1 Imperial, 6L. Lot 2066. Araujo Estate Cabernet Sauvignon Eisele Vineyard 1997. 3 Magnums, 1.5L. Lot 2065. Araujo Estate Cabernet Sauvignon Eisele Vineyard 2001. 6 Magnums, 1.5L. Lot 2064. Araujo Estate Cabernet Sauvignon Eisele Vineyard 2006. 3 Bottles, 0.75L. Lot 2063. Araujo Estate Cabernet Sauvignon Eisele Vineyard 2008. 3 Bottles, 0.75L. "First produced in 1991, the Vieilles Vignes was made from Block 3, the estate’s oldest vines of head-trained Eisele clone Cabernet Sauvignon planted in 1964 on St. George rootstock. Block 3 was the source of the 1971 Ridge, 1964 Conn Creek and 1975 Joseph Phelps Eisele Cabernets, all iconic, benchmark wines for the property and Napa Valley. Araujo made just one barrel of the Vieilles Vignes each year until 1998, when the vines finally succumbed to leaf roll virus. At the time, the rest of the fruit off Block 3 went into the Estate Cabernet Sauvignon bottling. The Vieilles Vignes was always 100% Cabernet Sauvignon and was not released commercially, but mostly given as gifts.Readers fortunate enough to own . . . [one] are in for a real treat." - Antonio Galloni, Vinous. Lot 2237. Araujo Estate Sauvignon Blanc Eisele Vineyard 2000. 2 Bottles, 0.75L. Lot 2235. Araujo Estate Sauvignon Blanc Eisele Vineyard 2001. 5 Bottles, 0.75L. Lot 2236. Araujo Estate Sauvignon Blanc Eisele Vineyard 2001. 2 Bottles, 0.75L. Lot 2234. Araujo Estate Sauvignon Blanc Eisele Vineyard 2002. 1 Magnum, 1.5L. Lot 2238. Araujo Estate Viognier Eisele Vineyard 2000. 1 Bottle, 0.75L. Lot 3578. Joseph Phelps Cabernet Sauvignon Eisele Vineyard 1986. 1 Double Magnum, 3L. Lot 2082. Joseph Phelps Cabernet Sauvignon Eisele Vineyard 1991. 1 Magnum, 1.5L.